UFOs many times appeared in Vietnam? VietNamNet Bridge – Unidentified flying objects UFOs, the mystery for the human being so far, were believed to turn up in Vietnam many times. More and more people in Vietnam have stated that they could see UFOs with their eyes, or could take picture of UFOs which they believed come from other planets. 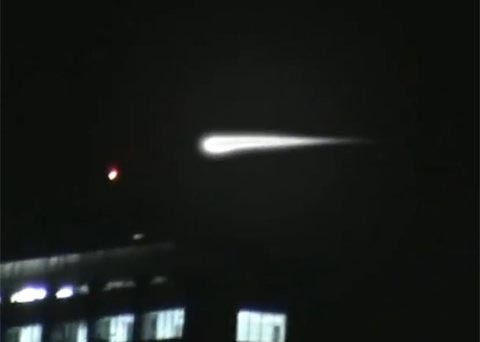 Most recently, an UFO appeared on the sky in the central province of Thanh Hoa. A picture showing a strange flying object was made public. The author of the picture was Le Khac Dat, 19, who lives in Hoang Ha Commune of Hoang Hoa district. Dat said the picture was taken at about 5 pm of December 9, 2012. Dat did not discover any strange thing when he took picture. However, later, when he reviewed the picture, he discovered an unfamiliar subject on the picture. The original picture of Dat has stirred up the public. Local people thought that this was really an UFO from another planet, who came to learn more about human beings. Meanwhile, others believed that Dat used his Photoshop skills to fabricate the story about UFO. However, the people, who saw the original picture, said they could not find any signs showing that the boy made some changes to the picture. People still have doubts about the phenomenon. The problem is that the UFO can be seen only on Dat’s picture, while no other person saw any flying object on the sky at that moment. On July 26, 2011, a 26 second video clip showing a light stain that moved slowly and then faded out suddenly in HCM City was posted on YouTube. A lot of people believed that this was an UFO. The author of the clip said he recorded the images at about 0 am of July 25, and the place was an apartment block in district 3 in HCM City. The video clip then raised people’s curiosity, who tried to analyze it to find out if these were “artificial images.” However, the author of the clip said he himself was not sure if this was an UFO. At 5 pm of October 28, 2010, Nguyen Xuan Vu in Hanoi recorded the images of a flying object which created stain of light on the sky. It looked like a burning object flying from the outer space through the earth’s atmosphere. However, Nguyen Duc Phuong from the Vietnam Astronomical Universe Society said on local newspapers that this was a civil airplane. A blogger has affirmed that an UFO once appeared in 1991 in a small village in Thong Nhat district of Dong Nai province. The blogger affirmed that on a day of the 1991’s summer, he saw a column of red fire rising above a tree tens of years old just for several seconds before it disappeared. Scientists have not given any explanation about the UFO in Dong Nai province. There has been no proof to say that this is an “artificial” UFO. The flying object appeared in a quiet and remote area, where material facilities are very poor, and it is nearly impossible to find fuel to create such a big column of fire, like the one created from a spaceship that is leaving the launching pad.